A step-by-step guide to finding & doing work you love, guaranteed. Start doing work you love. This program was designed based on the Passionate Work Framework, as featured in Scott Dinsmore's TEDx Talk on How to Find & Do Work You Love, which now has over 6 million views and was ranked one of the top 15 TED Talks of 2015. Live Off Your Passion Was Designed to Solve the 8 Most Common Challenges (Excuses) that Our Community of Over 200,000 People from 182 Countries Is Dealing With. If this sounds familiar, don't worry – you're not alone. Our community's sole purpose is to help you get from where you are now, to doing work that actually excites you (without having to sell out or become a starving artist). “I really felt like Live Your Legend was the perfect guidance and motivation for me at the time. I needed support, I needed to hear ‘you can do this.’ I loved knowing that Scott had gone through it too, and I wanted someone to tell me what steps to take. “In a matter of 6 months, I’ve gone from ‘one day’ thinking to actually taking the leap with my new adventure, The Catalyst Project, which has grown by over 10x since launch and has a number of ongoing paid business coaching clients. Wow! “I knew I wanted to serve others, but what was the best way for me personally to do that? LOYP helped me hone in on that unknown. I started coaching inside of my organization, then speaking to groups, then coaching outside my organization, blogging under my own name, podcasting, writing a book, and now I’m planning to make it more interactive by doing interviews, and hosting live events. The biggest risk is doing nothing. Do something. Try our proven step-by-step Guided-Discovery System and join our global community helping each other do the work they’re meant to do. Stop doing what everyone says you’re “supposed” to do. Do something that actually matters - to YOU. I did your very first Live Off Your Passion workbook and that was all I needed! I'm now thriving as a leadership development coach, helping others change their businesses, their lives, their world. And, I AM FULFILLED! “My life was almost perfect. I was a successful husband and father, a healthy Ironman athlete, surrounded by loads of loving friends and family, BUT something wasn't clicking for me at work. I now feel empowered to use my strengths and interests to make an impact in this world and when I decided to take a leap of faith and leave my job, I felt liberated. “I had no idea that one course could have the power to change my path, but Scott's heartfelt encouragement along with concrete action steps and reassurance gave me the push I needed to start living on my own terms. Working on my new business and career - my true passion - has given me so much energy and joy. Four months after completing the Live Off Your Passion Course, I'm now 'living my legend' as an office manager for a start-up oil and gas company. Within two months of being laid off, I was able to start my own consulting business, Wakefield Brunswick, by taking my past employer on as a client, followed by some other consulting engagements. “I was able to earn an income doing work I love, yet in a way where I had more flexibility. This has also allowed me to focus more on Mahila Partnership, a volunteer but passion-driven venture for me. I now get to travel the world (often with my daughters in tow) working with hospitals and communities to address health and gender issues in disasters. My life has changed completely. For more than twelve years I was stuck in jobs I didn’t like & felt like I was leading someone else’s life. “I quit my job, got my license as a running coach and can now do work I really love – and pursue a passion I’ve had since 9 years old. Live Off Your Passion made a huge impact on my life, inspired me and really made me WANT to change. My newfound focus helped me get a new, more flexible job, and see exactly what I wanted to go after. “Two months later, I was awarded a major matching grant to start an organization to give micro-grants to independent artists in Philadelphia! After what I perceived to be a failed attempt at living my dream job as a full-time performance artist, I set out to find out how to tap into the work I was really passionate about and how I could turn that passion into my life’s work. I kept feeling like I couldn’t access the ‘it’ and the stresses of whether I would ever live beyond ‘living to survive’ started to get me down too. When you're 80 years old, will you regret not taking the road less traveled and seeing what could have been possible? You could even do a weekend career change workshop and spend $500-$2500+ for just a few days! While these may and probably would help, they're crazy expensive! Plus, none of them come with a guarantee to work for you. So... which option will help you the most? 21 Days to Discover Your Passion is the very first step to finding and doing work you love. It’s for those who are just beginning the journey of living their legend. It focuses specifically on discovering your passion, while Live Off Your Passion helps you take the next steps to actually turn that passion into a business or career. It focuses on getting you into the momentum of taking action once you have discovered your passions. Our courses are designed to touch upon the different steps in the Passionate Work Framework. Nope. Living off your passion isn't only for people who want to start their own business. It's about finding and doing work that leverages your strengths, passions and who you are as a person, so you can start doing work that matters to you and to the world. That might mean working as an employee in a 10,000-person company or starting your own gig. That's for you to decide, and our course is built to help make those decisions much more obvious. Not at all. I realize that pretty much everyone has financial, personal and family obligations. I was in the same boat. The key is to find what excites you and begin to build a career around it long before you ever have to actually quit. That way there is a ton less risk and potential panic. Our goal is for you to make a transition that gives you the best chance at making your impact on the world. For many, that is a gradual process. We've also seen a lot of members who find ways to apply their newly­-discovered strengths to their current job, which leads to a whole new level of fulfillment and excitement, so they never even need to quit. It's pretty fun to see what's possible once you start making these discoveries! Absolutely. We believe the fastest way to do the things you don't think can be done is to hang around the people already doing them. Community and accountability are a huge part of making any change. Our private Facebook group will be huge for connecting with members and alumni from around the world. We want to get you started doing work you love as fast as possible. So right after you sign up you will receive instant access, along with all of the videos, audios, interviews, workbooks, downloads, and bonuses with a unique login and password just for you. We like to update the content when needed, so this allows you to login from any computer all around the world and receive the information at any time. The entire course is hosted on its own password­ protected website and you'll receive weekly emails to keep you on track. While the course is delivered online, it has a very simple layout, which requires very little tech understanding. We also have an awesome support team to help you out if anything comes up along the way. Each weekly module takes about three hours. And there are eight modules (plus two bonuses), so the full course lasts ten weeks. The course is self study so you can complete the modules whenever works best for you. There will be an email sent out at the beginning of each week that links to the corresponding module for that week, but you are welcome to complete it at your own pace. Not a problem. 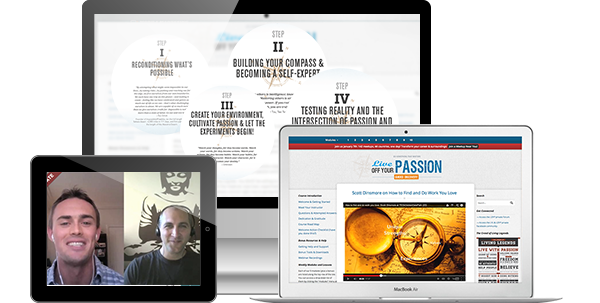 As a member of our Live Off Your Passion community you get lifetime online access to the course material and free updates forever. Once you're in, you're in for life. That's how we roll :). The course was created by Scott Dinsmore who also founded Live Your Legend, a global business and community dedicated to helping people find and do work they love. Since launching Live Your Legend, Scott has helped thousands of people make the transition to doing work that excites them. As one of the biggest career change communities on the web, currently over 200,000 people from every country in the world use LYL's career and connection tools on a monthly basis. Scott has also been asked to speak at events around the world, including TEDx in San Francisco, where he gave a talk on How to Find and Do Work You Love, that has since received over 6 million views and is ranked in the top 20 of over 35,000 TEDx Talks. And because no one does anything alone, the course also has over a dozen other industry experts to be sure we fully cover the most fundamental areas of doing work you love. Based on our existing members who have already joined and started to live off their passions, we think you are going to love what we've created­! But of course, we realize it can't be a perfect fit for everyone. At Live Your Legend we believe you should only pay for the things that actually get you results. So, if you go through the full course, do all the exercises and experiments, and within 60 days have not identified one of your passions, we will refund the whole course. Simply put, we believe in what we created in Live Off Your Passion. But we cannot do the discovery for you. We've done our part to create and continually improve this program that we know will give you the tools to facilitate making deeper discoveries. We have done this for thousands of people! But... your unique answers need to come from you. That being said, if you put in the work and go through the process, we are confident you will identify at least one thing that will help you identify and begin to spend time living out your passions. But if for any reason you don't gain value from this program, just shoot us an email at: support@liveyourlegend.net and we will provide you personal support and/or refund your purchase.